I know lots of us are squeamish about eating raw meat, but just because you don't want to try raw fish, doesn't mean you can't enjoy sushi. There are a lot of vegetables and cooked things you can put in a sushi roll that are nutritious, delicious, and not raw fish meat! 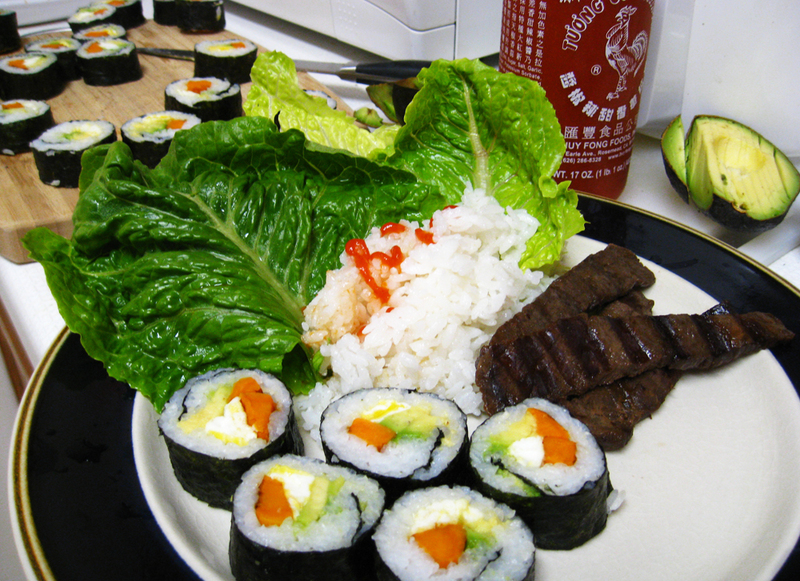 The Korean version of sushi is called Kimbap (or Gimbap, or Kimbob, or other permutations like that) and it uses all cooked things or veggies. It's a fun way to mix up your lunch and to try out your favorite flavor combos. OR add in your own experiment! Drizzle about 1T of sesame oil on the rice when finished cooking and mix in, set aside to cool. Lay the nori sheet rough side up, shiny side down on your bamboo mat. Spread about ½ cup of rice onto the seaweed, leaving the top inch empty. Try to smooth it on gently rather than mash it on. Slide your thumbs under the mat and roll up from the bottom to cover your fillings, press down and squeeze down and back toward yourself making a tight roll. Continue to roll, making sure to tightly squeeze after every motion. Stop when you reach the empty space you left. wet your fingers and glide them across the flap and then complete the roll. The water will seal the seam to hold the roll together. Cut each roll into about 3/4 inch slices. Arrange on a plate and eat! You can also dip these rolls in a mixture of soy sauce and vinegar as a condiment. Your kimbop looks pretty! This makes me so hungry! it's probably the only food that photographs well, too. yum. i want some. Ooh sweet potato- I would have never thought of that but it sounds like a good combo!maybe cream cheese and sweet potato? Hello! You were featured today on Simply Step Back (again)! Stop over and grab (another) button!